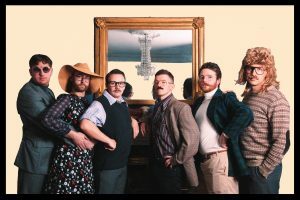 Seven years after their last release, Ireland’s favourite indie outliers Super Extra Bonus Party return with a new single. They look back to their blistering best. 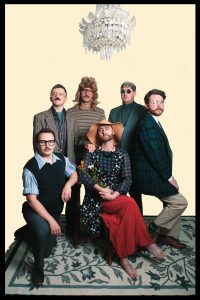 IT’S EARLY 2007, and against all the odds, Newbridge band Super Extra Bonus Party are stood on the stage collecting a gong and a large cheque, having taken home the Choice Music Prize for their self-titled debut album. It’s probably the most controversial decision in the history of the competition. Cathy Davey, Delorentos and Kila are all household names, and all have acclaimed albums up for the award, but it comes as little surprise to those with their ear to the ground of Irish music. An album that’s only touched on the fringes of mainstream consciousness has, in some knowledgeable corners, been hailed as the most inventive Irish album in a decade. With follow up Night Horses, the hip-hop/ indie fusion act returned with abundant Dublin-scene special guests in 2009, accompanying the searing and memorable release with a series of blistering and beloved live shows, before calling an indefinite hiatus in 2011. Whispers of a return began as early as 2015, and with November’s new single ‘Switzerland’, the revered six-piece (seventh member Rodrigo Teles has sadly departed Irish shores for his native Brazil) have finally returned to the fray. “We’ve listened to hip-hop forever really and it’s still a very integral part of the band and one of our main influences,” Stephen ‘Fats’ Fahey adds. “It’s a very natural part of our arsenal, so we’d be producing tunes with a hip-hop influence regardless of the climate for sure.” The climate, though, is very likely to be still more accepting than last time around, and that can only be a positive. That writing process has come very naturally, with Fahey describing the progression as less challenging than last time around, at least so far. New single Switzerland, naturally, went through a slightly messy, iterative process, as has much of Bonus Party’s work. The result is a glitchy, bleeping melody fused with power chords and fresh, echoey vocals. Switzerland is not to be a one-off. The band are already announcing shows, and an album – jokingly working-titled ‘Led Zeppelin 4’ – is on the longer-term horizon. “The album is still our yardstick,” Fahey tells us. As for that big moment at Vicar Street all those years ago? This article is part of my weekly music column for the Dublin Gazette, reproduced here with permission. Note: this column is published in the Dublin Gazette several days ahead of on this website. The Gazette is a freesheet paper available across Dublin, published on a Thursday. Pick up copies at these locations.